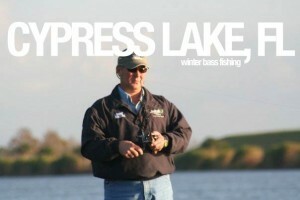 This week Bob is headed south to beat the cold weather and do a little Florida bass fishing. Bob and Tim Fey and they will take a little trip to Cypress Lake just outside of Lake Toho for some early winter bass fishing. Cypress Lake is over 4,000 acres of great fishing, fun and an extremely popular lake for out-of-state anglers. It’s close to Kissimmee, Orlando, and all that Disney has to offer, but far enough away from everything to let you escape and enjoy the outdoors. Cypress is full of black crappie, bluegill and largemouth bass, we highly recommend you take a day to fish this lake the next time you’re in Florida. This entry was posted in Episode and tagged bass fishing, bob redfern, cypress lake, fishing, florida bass fishing, kissimmee bass fishing, lake toho fishing on 01/22/2010 by BROM.